meaning that the program can ramp up,” Mr McMillan said. “With over 250 Sharefarm Agreements with local farmers in the Midwest alone, thinning the sharefarms is a big job, but promises to provide better logs in the future and a good return to the landholders over time,” Mr McMillan said. As the annual rainfall has decreased over the past few years, some of the unthinned plantations have been prone to drought as the trees run out of groundwater. 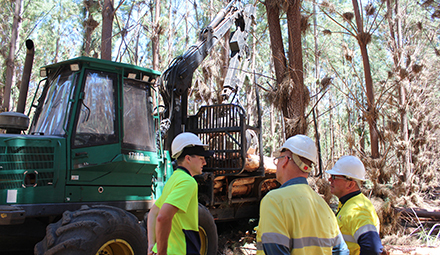 “We have around 150 landholders in the Midwest and approximately 12,500 hectares of softwood to thin, so while it’s a lot of work, we’re just glad that we can provide positive outcomes for the trees and landowners,” Mr McMillan said. The new markets for the thinned trees include chip and residue for local poultry growers and industrial wood grade logs for export by container to sawmills and plymills in China. “The thinning program will continue at a rapid pace for the next five years across the Midwest,” Mr McMillan said.